Esoteric School of Shamanism and Magic Blog: What is a Magick Spell Really? Magick spells come in all shapes and sizes from the very simple to the very complex. Anytime you encounter a situation or condition that you can't affect directly is a great time to use a magick spell. This is especially true when there are complex factors or barriers to overcome that require a lot of force. A short, concise explanation of a magick spell is that it is any psychic or magical operation creating an energy matrix by combining a mix of the elements air, fire, water, and earth that may also program factors and carry an intention to produce a specific result over a period of time. By this definition chants, litanies, sonics, directors and limiters, and even prayers can all be spells just as more formal candle spells, multiple candle spells and Tarot spells can. The type of spell you choose for any given situation depends on factors such as the number of obstacles that must be overcome in achieving the end goal, the size of the problem, and how big an area or number of people to be affected. When designing and creating your own spell you need to have a thorough understanding of directors and limiters, basic magical operational laws, the terminology involved with spellwork, and the properties and characteristics of the four elements. Magick is a precision science as well as an art and since altered procedures produce altered results it is important to have a strong magical foundation before attempting to create larger complex spells. Directors and limiters are an especially important part of the design process because without these safeguards of defining what specifically the spell will do and what it will definitely not do, the spell will take the path of least resistance to the goal. Even if the goal of the spell is in accordance with the Rules of the Road that govern magical practices, the path may not be if you have not well defined it. This can cause major repercussions since the Universe doesn't care what you intend; only what you actually do. While more complicated spellwork takes special training such as you can get through our Basic Magic Course, you can try out some very simple spells for yourself such as this one for attracting money or this very simple basic spell to get a boost in energy. 1. Get a pure bright yellow candle with not too much orange coloring in it; unscented is best. 2. Stand or sit in the South facing North and have the candle in front of you. 3. Light the candle with wooden or paper matches. 4. Let the flame grow steady and tall into a good "working" flame. 5. Now charge the candle by holding your hands so that they are close to (not too close that you get burned though) and cupped around the flame. 7. 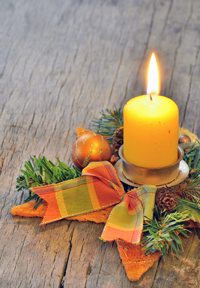 Now simply leave the candle burning for at least 30 minutes making sure it is on a plate or other protective surface and not a fire hazard. 8. Once you feel ready and at least 30 minutes have passed, blow the candle out. Take a few moments to see if you feel a difference in your energy level and quality of your energy. Most people report they feel lighter, energized, more harmonious and more peaceful.